Saffron is such a spice that in Sweden in principle is only associated with December and Christmas. What a pity since there are so many tasty things to do with it, think risotto milanese (classic Italian risotto), rouille (french mayonnaise with saffron and garlic) and all the good recipes that include saffron from the Middle East! It is important that there are still some bite left in the baked apples to get different textures in each bite. If you want, you can prepare the apples in advance, you can always heat them up just before serving if you want the contrast between the hot and the cold. Prepare the day before; add the chia seeds to a bowl and add the milk. Stir well and cover with a lid. Leave the bowl in the fridge until the following day. Pour the chia seeds and milk into a high mixing bowl and add the banana, some extra milk, vanilla powder and saffron. Mix with a stick mixer until it has become a smooth and fairly smooth cream. Set aside while preparing the apples. 1. Peal, core and cut the apple into small pieces. 2. Add some coconut oil into a frying pan and add the cut apple. Bake on medium heat for a few minutes and then add the raisins and cinnamon. Add water and bake for a few more minutes while stirring until you have warm but still with a bite apples with a sauce. 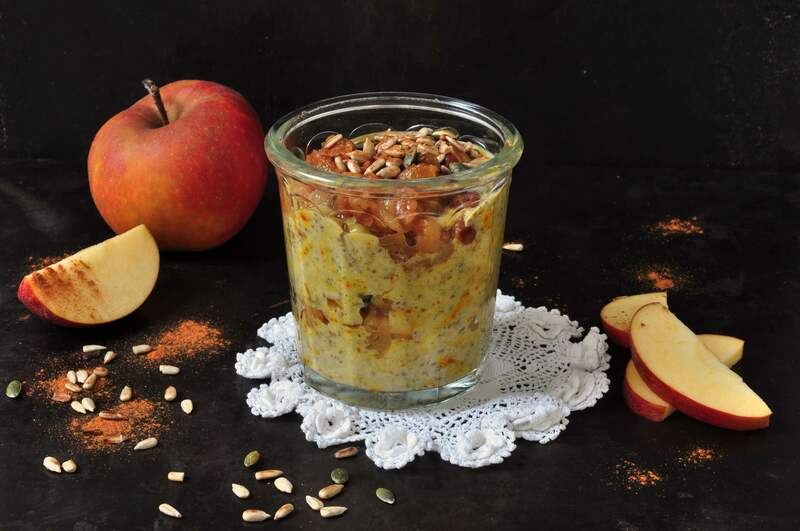 3 Layer the chia pudding with warm apples in a bowl or glass, preferably in glass so that you see all the beautiful dots from the saffron and the different layers. Sprinkle some roasted seeds, maybe cocoa nibs or my Christmas granola on top. Thank you for your comment and reading my recipes! I’m happy to read that you like the apples. They are really so easy to make and taste great any day.